i'm still loving pink, yellow and aqua and while i'm still working on my night sky blocks i just got a *little* bit distracted! 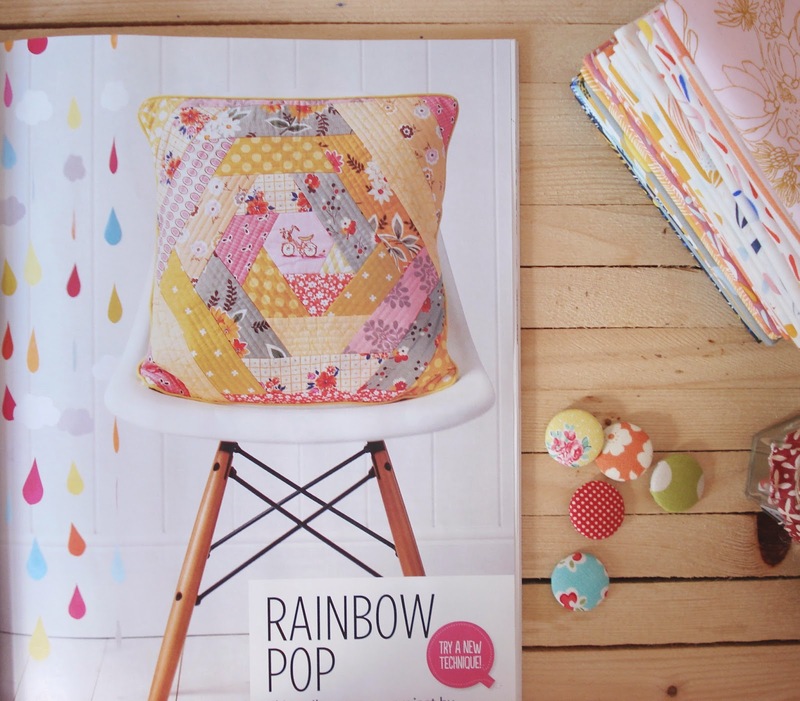 have you heard about love quilting and patchwork magazine? you more than likely have unless you close your eyes and cover your ears a lot! i get it *nearly* every month but have never, ever made something from it (hands up who else gets magazines and never makes what's in them?) until i was looking through last months and was stopped in my tracks! and it was soo fun! 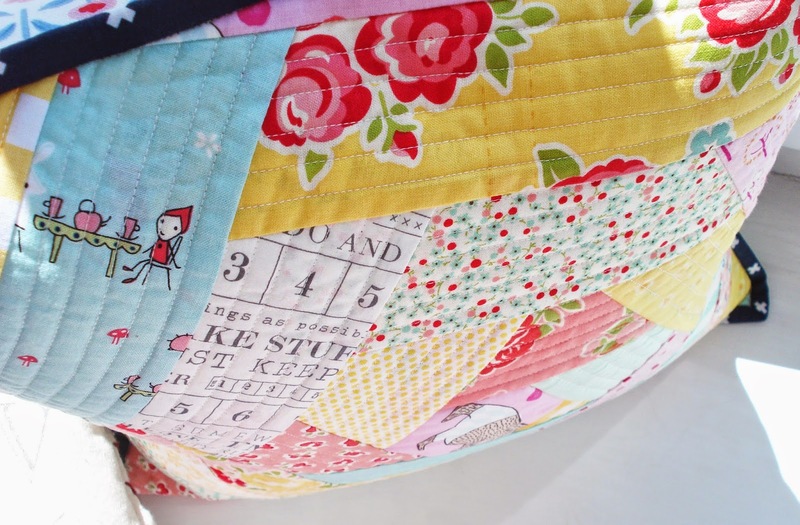 i never really understood the whole concept of quilting as you go, but it's literally what it says on the tin, you sew a piece down and then quilt it, having done it now seems super obvious, but i could just not understand how to do it before! 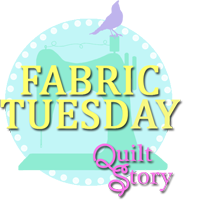 i really like the look of the straight line quilting, cause i am usually a free motion girl, so it was fun doing straight-ish lines. and wow does it use a lot of thread, i used 2 bobbins! my cushion came together really quick and it is a really well written pattern. 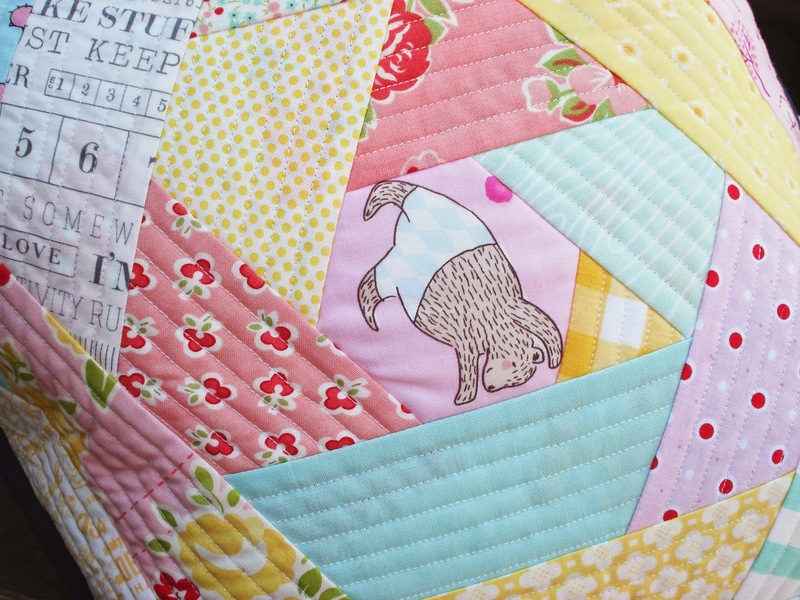 now that i've tried QAYG i want to make all the things, next up i think i'll have to make a QAYG quilt, maybe this one! have you ever tried QAYG? did you like it and find it super fun? what have you made using QAYG? It's been a while since I QAYGed but it is fun once in a while. This looks great but then I am a bear nut. I love it! it is so sweet and looks lots of fun! I've seen QAYG bags too but you can't beat cushions! 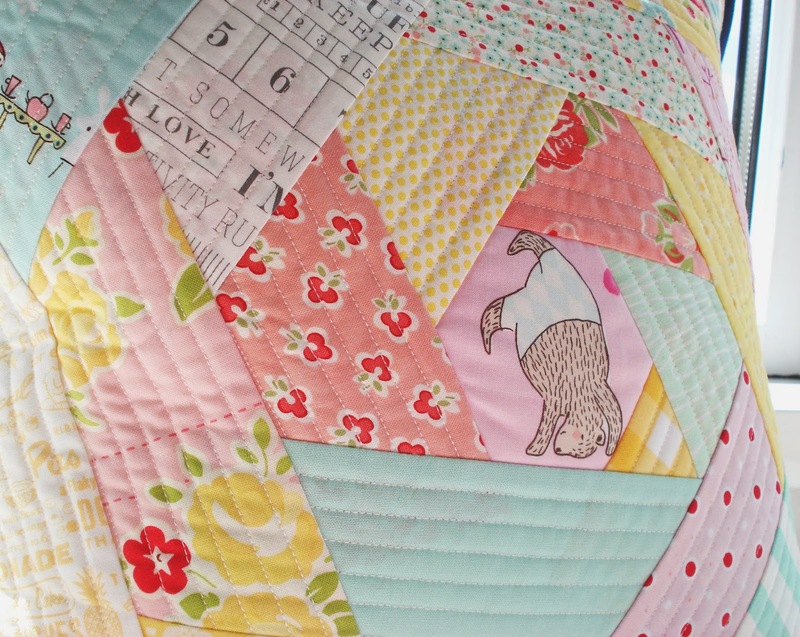 Your cushion looks wonderful, and the bear at the center is just so cute! This is such a fun pillow, I love how the shapes come together that way, QAYG is so fun that way! So cute pillows you've made. I've tried this on some potholders, but I had no pattern, and didn't understand fully how to do it. Maybe I shoould find a pattern? I love the little bear!! Thats absolutely brilliant fussy cutting. I've become recently obsessed with making QAYG bags, but I haven't tried it with a quilt. I'm not sure how you could connect quilted blocks together! 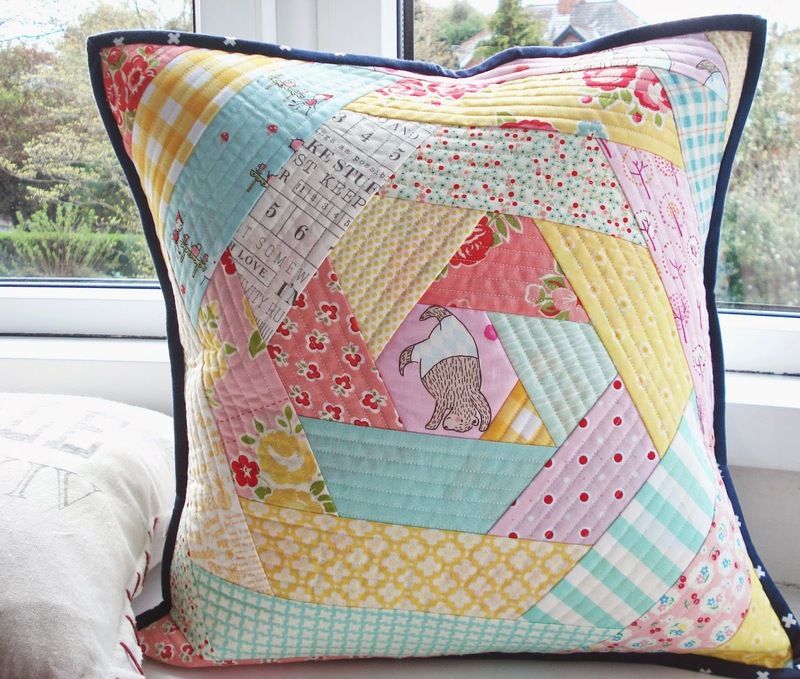 gorgeous cushion! 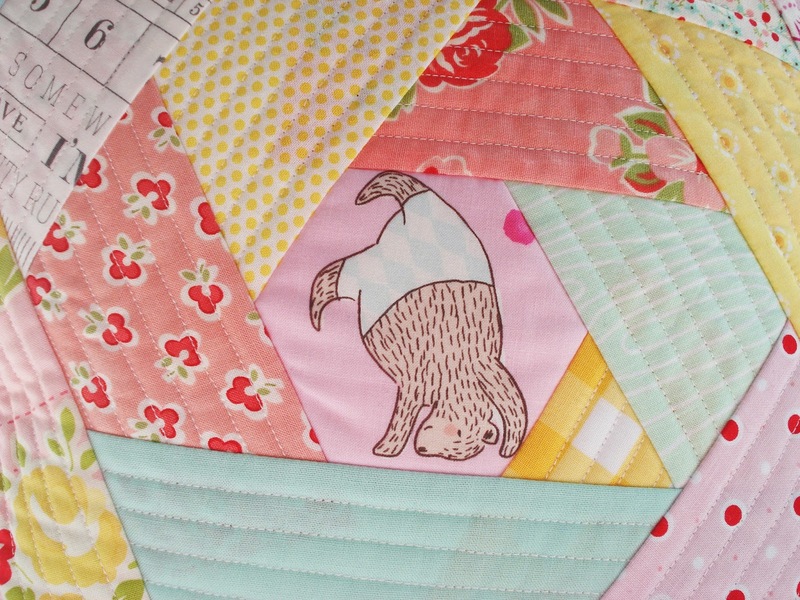 And what could be a better fussy cut centre than a bear doing a handstand? 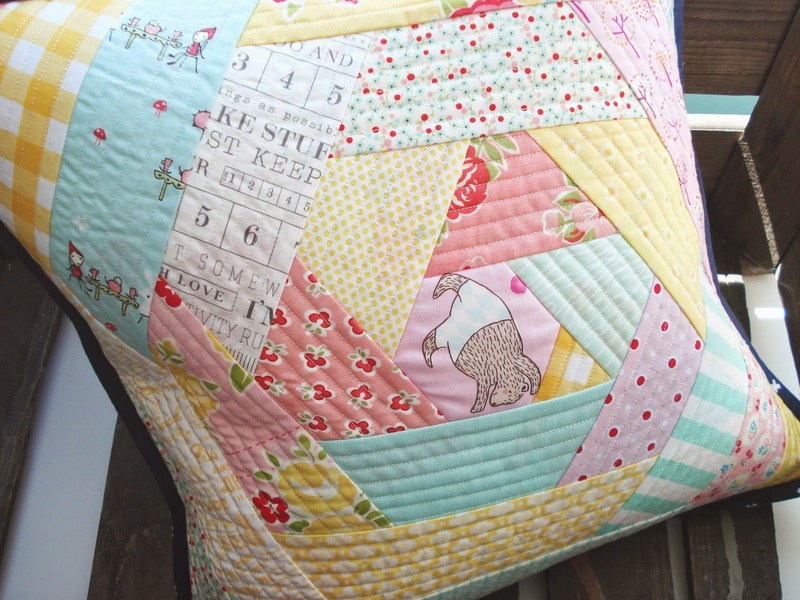 I did try quilt as you go, just on a scrap basket I was making and it seemed to take forever! I just love your version!! I'm so flattered by your post, thank you!! I did use it on a potholder and that part was great. It was the binding that turned it into a 5th grade "good try" category. I wonder how you do binding on a pillow. I'll have to look it up because everything about your pillow is so stinking cute! Seriously, love it and I can see why you had to sit down and make one when you saw the original. It is a great pattern!